My poor Sunnie boy has the itchies. He has been backing up to just about everything in the pasture and when he’s in my yard to graze the clover, the apple trees stand no chance (thus he gets chased a lot). So I’ve gone out and bought a couple of products that I hope will help him out. 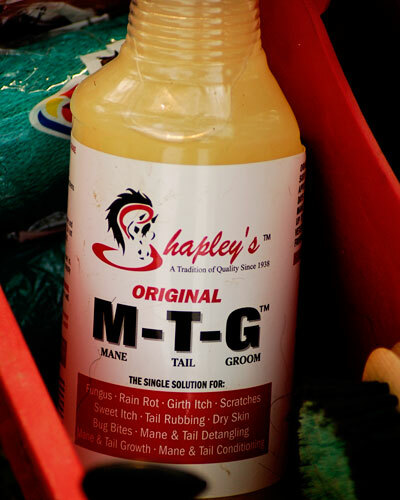 The first one is Shapley’s M-T-G.
I’ve heard a lot of good things about this product and they claim that it will cause three inch mane and tail growth in one month, if used according to their directions of course. It is kinda stinky, like sulphur or something burning. I put it on without gloves and it didn’t really bother me too much and actually the residue smell came of after a couple of hand washings. I’ve heard the horror stories of the stench but it truly wasn’t that bad. 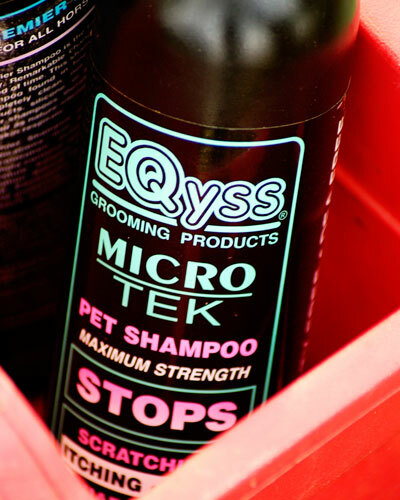 The other product I’ve had for a little while is this shampoo made by Eqyss. 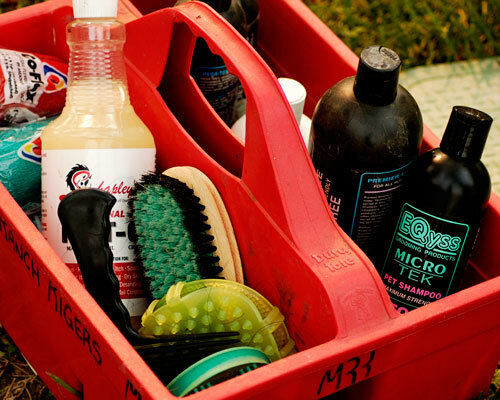 I like the company’s products as they seem to work fairly well and I like that they aren’t made up of a bunch of chemicals. I’m more of a natural gal I guess. This stuff worked wonders on my dog, Oliver’s, hot spot he got about a year ago. 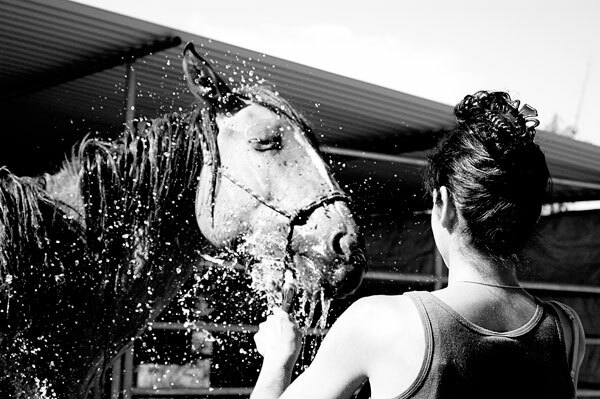 I washed him in this stuff and then used Eqyss’ non-itch spray every day for a week and that thing cleared up wonderfully. I am participating in a Solstice Shoot competition held by the Equine Photographers Network. The object is to take photos of horses on the solstice, or in this case June 20th and they’re supposed to be of the “photo journalism” type. I went over to a friend’s house who actually owns a two year old colt bred by me! The colts name is Emiliano Zapata or Zap for short. 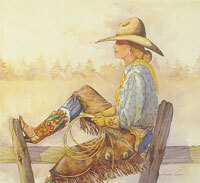 His sire is my now gelding Sunnie and his dam is my grulla mare, Etta. Out of all Sunnie’s foals, he is one that I would have kept. He had a nice compact, well muscled, balanced body and quite a personality to go with it. Zapata is not spooky, he loves to be into everything and can be a general nuissance. Just the way Iike them. 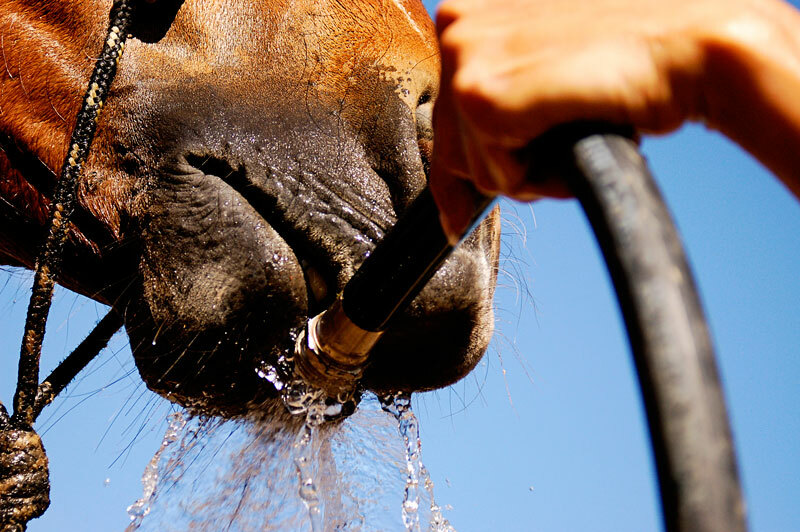 Tracey is impressed because she already has a nuissance of a horse named Joe, a nice pinto who takes halters off, drags around his stall mats, plays with the hose, steals tools… Zapata does all that too. They even undress eachother and rid their burden of a fly mask. 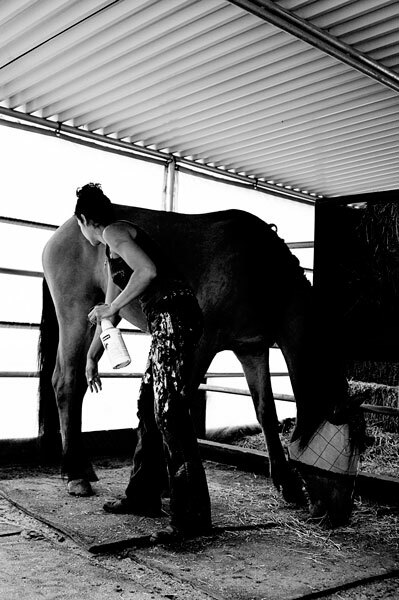 So I had fun shooting Tracey and her colt as they messed around. 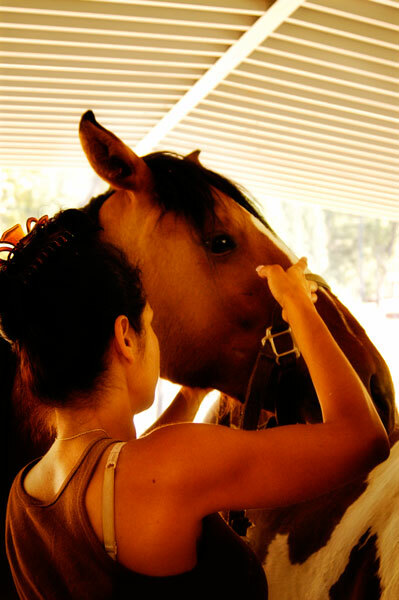 I’m helpig Tracey each week by going over and being support in their training sessions. We worked on the fly mask thing when I was there shooting and Zapata quickly accepted it. We did find a nasty wound on his jaw where the halter sits and had to irrigate it too. 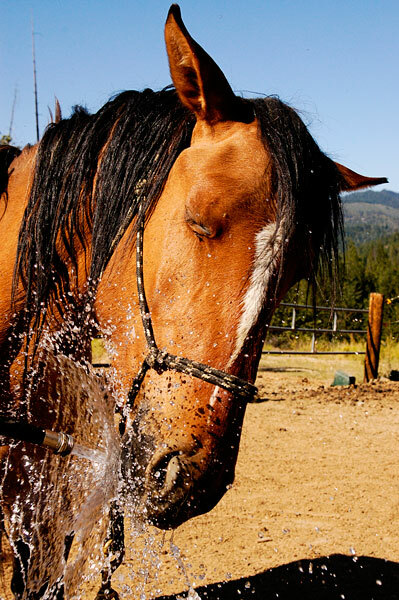 Thankfully he has no problem with a hose. So we plan on another session tomorrow and were hoping to give him his first bath. I am not sure about that though as we’re still covered in smoke here and actually ash is falling. Our visibility is probably a quarter of a mile or less, it’s pretty thick. 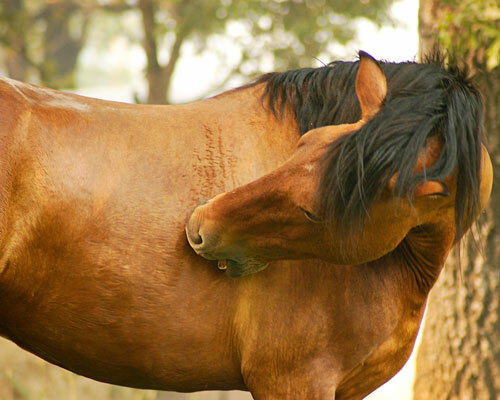 So we may just stick to the fly spray, fly mask, picking up feet, and general putzing with him just to play and make all these horse things sink in. Tracey needs some reassurance and I need to get out and do something. We’re having fun.